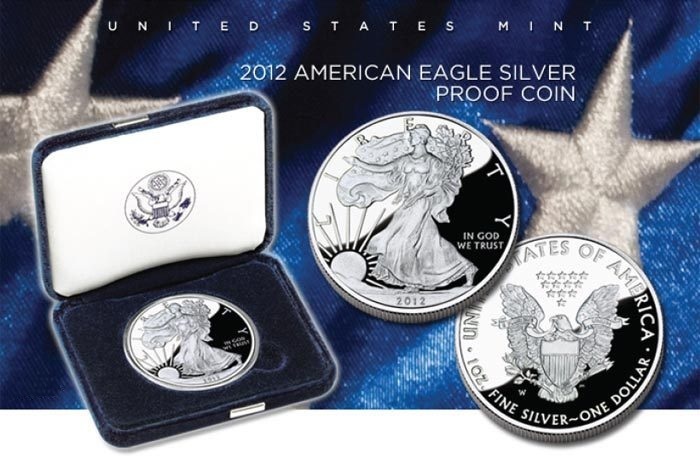 2012 Proof American Silver Eagle - SOLD OUT AT THE US MINT! The 2012 proof silver eagle was minted at West Point, New York and includes the original mint packaging, velvet presentation case and Certificate of Authenticity. The coin features the prized "W" mintmark on the reverse. The release of the 2012 proof silver eagle follows the 2011 proof silver eagle which was only available for about six months from the US Mint before it sold out due to heavy demand. The 2012 proof silver eagles recently sold out at the US Mint so please order now while we still have our remaining stock available. Coins may sell out without notice. Copyright © 2000-2012, Silver Eagle Coin Company. All rights reserved.